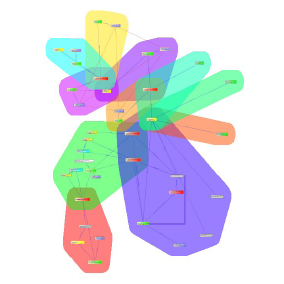 Our network visualizer is able to handle large amounts of heterogeneous data, and supports efficient searching and browsing a network of nodes. We have also implemented a set of graph-algorithms that can help assigning a score to each node within the network that correlate with the "interestingness" of the node, related to the query. So this tool is able to show only the most relevant part of the large network to the user. The efficient searching and ranking capabilities are provided by a server-side C++ code, while the visualization is done by a client-side Java application.